Obituary for Ann M. (Petrick) Cinibulk | Beatty-Rich Funeral Home, Inc.
Ann M. (Petrick) Cinibulk, 95, of Madison, died Friday, Jan. 25, 2019, at TLC Care Center in West Newton. 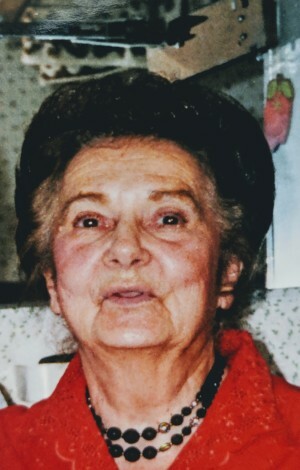 She was born Dec. 10, 1923, in Humphreys, daughter of the late Stephen S. and Mary A. Lukac Petrick. In Ann's younger years, she loved to go dancing. She was an avid gardener, loved her cat, Chloe, and her dogs. And most importantly, she loved her faith and always said her morning prayers. She was preceded in death by her parents; her husband of 49 years, Eugene P. Cinibulk; three brothers, Stephen, John and Andrew Petrick; and two sisters, Mary Beran and her infant sister, Elizabeth Petrick. She is survived by numerous nieces and nephews, and a very special niece, who took care of her for years, Pauline J. Kristoff, of Madison. Friends will be received from 3 to 5 p.m. Sunday, Jan. 27, 2019, at the BEATTY-RICH FUNERAL HOME INC., Route 136, Madison. Anyone wishing to attend Ann's funeral Mass is to go directly to Seven Dolors Catholic Church, 102 Center St. Yukon, at 10 a.m. Monday, with Father Richard Ulam, O.S.B., officiating. Private interment will follow at Unity Cemetery in Latrobe. The family wishes to thank TLC Care Center of West Newton, and Promise Hospice for all the love and compassionate care that they gave Ann. To leave an online condolence, please visit www.beatty-richfuneralhome.com.